During Silent Hill: Revelation’s closing credits the audience is treated to a series of slow-mo shots depicting a fake battle scene that pits a pack of the cursed town’s provocative, crumple-faced nurses against a grotesquely spider-like mannequin monster briefly seen in the film. If you’ve watched any recent summer blockbuster, action or comic book adaptation, you probably know the kind of sequence this is: mostly slow highlight acknowledgements of the principal cast and crew underscored by pretty CG visuals. In Revelation’s case, these closing titles mean numerous shots of the gangly, doll-bodied abomination whacking nurses out of the air, screeching vaginal terror-mouth and all, with various fade-in close-ups on the ample busts of said (decidedly unsexy) nurses. Revelation’s monster designers seem particularly proud of these two horrors (neither of which are given more than five minutes’ actual screen time), since they’re apparently more interested in making you view this scene of freakish ouroboric cannibalism from as many angles as possible rather than, say, visually parading out the various inhuman aberrations seen elsewhere in the film for a quick fashion show. It’s kind of telling, since for all its egregiously nonsensical violence Revelation has few hellspawn to actually show you. It’s the curse of the videogame movie: somehow find a narrative explanation (that thing is trying to kill you!) to encounter what would be standard game enemy types, then try to pretend you didn’t just waste however much time and budget on a fleeting effect the audience has already forgotten about. The idea here is just to gorge, gorge, gorge on set pieces, not unlike a dull Call of Duty-type spectacle but somehow less interesting and with more gore ­– no wonder these types of movies are always left wanting for any tension. Parasitic consumption aside, I knew full well that Revelation was going to be awful going in. This $20 million dollar joke reportedly didn’t make even half its price tag back during its opening Halloween weekend – I haven’t followed up with the numbers since its recent video release but the deafening roar of silence surrounding it is probably a good indicator. Yet when it hit theaters (and for reasons I still can’t quite explain aside from sheer masochism) I made a pact with a friend to commit the unforgivable sin of furthering the possibility of a third Silent Hill film through our willing ticket sales. “We’re literally about to go through Hell,” I joked beforehand. Sadly we both knew it was true. It’s apparent that Silent Hill has been floundering in mediocrity for a while now, the vestiges of former psychological depth that made its initial few offerings so interesting almost entirely reduced to a sad mockery of themselves. I can’t even heap such praise on Revelation, at once a terribly adapted attempt at Silent Hill 3 and simultaneous sequel to the first Silent Hill film; the ordeal of sitting through its hackneyed scares was a kind of survival horror all its own. It’s not worth running through the number of times my friend and I groaned or even let loose in outright laughter at Revelation’s on-screen action. The first ten or twenty minutes alone has an abundance of dopey imagery that’s unintentionally hilarious: a handful of no-face extras with stitching where features would be, fish-eyed POV shots of blood-dribbled children feasting on random flesh, a deformed man sawing off a sizable chunk from a living victim’s body (as a fry cook ghoul cheerfully tends to a grill. Yeah). So attempts at horror iconography don’t really make sense. 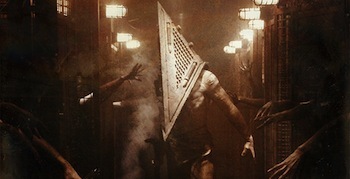 The once sexually-violating Pyramid Head piloting a Da Vinci-esque carousel-elevator to Hell? Pretty goofy. 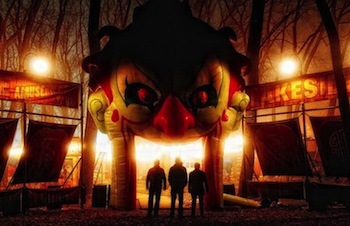 A wacky waving inflatable arm flailing tube man lurking in the background mis-en-scene of a demonic carnival? Possibly priceless. Like its predecessor, Revelation is proof the videogame films remain an impossible dream, if an irrelevant one. The divide between Hollywood expectation and an IP’s narrative essence is one game makers are often just unwilling to concede. (The Gears of War film will probably never get made, for example, over Gears’ lack of love interest.) Time will tell on whether or not the upcoming high profile Assassin’s Creed and Metal Gear Solid films – with Michael Fassbender and Marvel producer Avi Arad respectively backing – can break the bad game-to-film cycle. At this point I don’t really care. When the current adapted result is on par with Revelation, whose climax is a melee monster vs. monster cage battle that thrusts Pyramid Head into a hero’s role, it’s probably already a lost cause. Steve Haske is pretty sure he can take Pyramid Head mano-a-mano. Watch him train on Twitter @afraidtomerge.